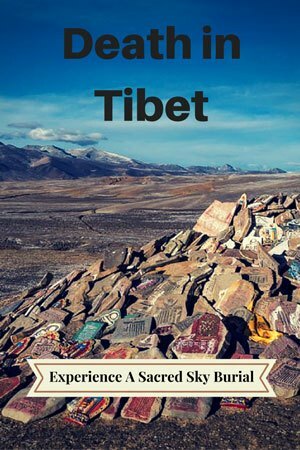 Life and death on the plateau – experiencing a Tibetan sky burial. Stones carved with Tibetan script piled on the hallowed grasslands. The flames of the fire warmed my shivering legs on a below-freezing Wednesday morning, as a middle-aged Tibetan man in extravagantly decorated garb poured us another yak butter tea. Vultures circled overhead, throwing their broad shadows in spectacular dances across the frosted earth. The gathering of almost 50 local men joked amongst themselves, acknowledging our presence with courteous smiles and nods. The sun began to peak over a distant mountain, and as the shadows danced across the plateau the group turned and started walking purposefully up a shallow hill. Our friend with the tea nodded at us; The sky burial was about to begin. Five unassuming fellows opened the back of an idling SUV and carefully lifted a cumbersome white bag from the trunk. They placed it on a sprawling, flat stone, encircled the sack and dutifully started chanting Buddhist mantras. Cautiously they emptied the sacred contents of the bag onto the blessed stone. The naked body of a lifeless man collapsed limply onto the hallowed ground. Without further word, knives were suddenly brandished, and the vultures touched down a few metres from the scene. A supervising priest wandered up from the fire, took a deep breath, and gave the final approval. Immediately the men dropped to their knees and started to dismember the body, determined and methodically. In the high-altitude plateaus of Tibet a compelling tradition is used to dispose of the bodies of the deceased. Above 4000m, the frozen topsoil is too rigid to dig below the first few inches, which makes burying the dead almost impossible. The arid landscape is void of trees, making cremation an uneconomical task that is only reserved for the most esteemed of fellows. In keeping with the beliefs of Vajrayana Buddhism, which is heavily practised throughout Tibet and parts of Mongolia, a sky burial is considered to be the most generous and practical means of disposing a corpse. Prayer flags strewn across the hills behind the site of a Tibetan sky burial. On charnel ground called ‘durtro’, a body is dissected by a handful of body breakers, known as ‘rogyapas’. The duty is not done in a morbid and sombre manner; Instead the men joke and make idle chat, in the belief that laughter will help guide the spirit of the deceased from the uncertain plane after death and into the next life. Relatives stand in the distance amongst fluttering prayer flags – present, but out of sight of the ritual. On this chilled Wednesday morning in the hills of a Tibetan town we stood on the outer edges of the ceremony and quietly observed as the men finished their first macabre task. When the limbs were cleanly separated, the rogyapas backed away from the body and allowed the waiting birds of prey to flock to the site. Furiously they picked and tore away at the flesh, fighting amongst themselves in the process. We watched with jaws agape as the vultures rapidly devoured the figure. The body of the man quickly disappeared in a flurry of activity. After a few minutes the men moved forward again, scaring off the carnivorous birds. Gathering the remains into a pile with bare hands, each rogyapa started mixing tsampa, a traditional Tibetan food, with what was left of the flesh and bones. The barley flour and tea blend absorbs the fluids of the body and makes the skeletal leftovers more appetising for the vultures. The knives were traded for compact axes and the body breakers began chopping rhythmically, separating the pieces into smaller and smaller fragments. Each section was then thrown to the onlooking, ravenous vultures. Buddhists believe that once you pass away your body becomes an empty vessel as your spirit moves onto the next life. There is no emotional connection to the corpse, as it no longer contains a soul. The feeding of the birds in a Tibetan sky burial is considered to be a final act of generosity by the deceased and their relatives, which provides nourishment to living beings. This act of compassion towards another species is an important and deeply respected Buddhist virtue. Flames lick the frozen sky, consuming the remains of the deceased. The rogyapas shovelled what little remained of the body back into the plastic bag. Joking amongst themselves, they carried it to another side of the hill and lit a fire in a steel furnace. In one last act of finality, they threw the bag into the roaring inferno. I stared into the flames as they flickered gracefully around the frigid sky. The rest of the men urged us to stay with them to watch the vultures consume the final pieces of the dead. Cigarettes were sparked and offered around, tobacco smoke spinning skyward to mingle with the frozen air. All around us were fragments of bone, scattered like discarded confetti. Smiling, one man picked up a shard to show me, before dropping it back to the earth. There it would stay for an eternity, the only evidence remaining of what was now the empty vessel. The vultures pecked at their last morsel as we returned to the fire to sip on more yak butter tea. The sun was high in the crisp blue sky, brightening both the terrain and the ambiance. The mood remained jovial, belying the spiritual importance of what we had just witnessed. The gathered men idly chatted, the odd laugh chorusing out over the grasslands. The body breakers scrubbed their arms and hands with water, ridding themselves of any evidence of the sky burial. Alesha and I downed the last drop of tea and politely shook the hands of each man we had interacted with. When the rogyapas extended theirs to say goodbye, we shook them without hesitation, respect outweighing any thoughts of what may remain on their hands. We walked back towards the waking town, prayer flags and cheerful men waving behind us. In the observation of the traditional Tibetan ceremony we had learned more about this culture than books could ever teach. In each death there is also life – one previous and one to continue on, whether it be in the form of a soaring spirit or that of a nourished bird. On the hills of ancient Tibet, in the welcoming presence of peaceful mortals, we could almost sense the dead man’s spirit passing gracefully into the next life. I’m currently researching on this entire ritual for a documentary on Birds. Since this invloves the vultures we are trying to capture this on film. Unfortunately Tibet (China) does impose some heavy restrictions and hence we are having to move this to other heard locations in Nepal, India or Mongolia. Can you assist us in with any information with regards to the same like any locations that you may have heard off in any other countries and any links which can assist us in the same. Thanks very much Katrina. It was quite fascinating to experience for sure. Such an amazing thing to experience. Not many people get the chance to witness this. It was captivating for sure. Thanks for reading guys. Thanks for sharing, not many can say they have seen something like this. It was quite the experience, that’s for sure. Thanks for reading Carrie. What an event to catch! It is definitely not something we will forget in a hurry. Thanks for reading Katie. Beautifully and sensitively written. I’m not sure I could watch such an event but what an interesting post about something I was unfamiliar with. We purposefully kept the details of where it is and how we found it so as not to attract more attention to the ritual. We made our own way to the site and then were invited in by a bunch of Tibetan men. However it is becoming a bit of a tourist attraction in some parts of Western Sichuan unfortunately. Thanks for reading Flora. This was a very compelling read, I felt as though I were watching the ritual through your eyes. It’s interesting to see how different cultures view the concepts of mind, body and spirit and specifically what happens after death. To someone foreign, this idea of dismembering the body of a deceased loved one and feeding parts to vultures might seem incredibly and ruthlessly macabre. But if you think about it, as humans we are no different than other animals who have their own place in the food chain. After all, the person isn’t there in the body anymore and even though that’s the harsh truth, it is extremely hard to accept. Very well written. You really captured the beauty of what must have been a wonderful experience. We really enjoyed our time on the Tibetan plateau. Were you in Tibet proper for this? We never crossed the official line because the border was closed during our visit to the area. Safe travels. Thanks Donny. We weren’t in Tibet proper for the same reason – we needed special permits that were hard to get. Perhaps one day in the future, but they really are oppressed in Tibet. I’d always wanted to witness such a ritual, too. Weren’t you nauseated by the sight of the dismembering? And how did you find a local who could take you there? I’m glad the family members are away at a distance. I can’t imagine seeing a loved one undergo a sky burial! I have to admit, it wasn’t the most pleasant sight. However we didn’t feel nauseated. It was such a unique, spiritual experience and when you think about it, completely natural. We were more fascinated than anything else. The owner of our guest house told us about it and we went out in the morning, but stood very far back from the crowd when we arrived. A few Tibetan men approached us and invited us into their circle, which is why we ended up joining. Thanks for reading, Aleah.